Happy Saturday, anyone who’s reading this! Welcome back for part three of our "Making a Promo” series where you’ll find out everything that goes into creating beautifully designed and drastically underwatched promotional videos. Today we’ll explore a short animation test of our lead character, Tom. An animation test of our leading man, Tom. You know, as in Thomas. Testing out your animation is important not just to decide how your character moves but also forces you to be more familiar with them. We started this animation as just a round red ball with a face and stem. But after animating Tom, we know that he is a single father with three kids and a golden retriever puppy that gives just too many kisses! His job as an account manager at a struggling small business isn’t fulfilling enough so he works as a paid extra on weekends. This video was created with several different design/animation programs. First we used Autodesk Sketchbook (which just went entirely free - so get it, it’s honestly the best digital drawing software) to design the character. You can go as far as you want in terms of completing the character: thumbnail, line drawing, shaded, inked, or even fully rendered (our preference). 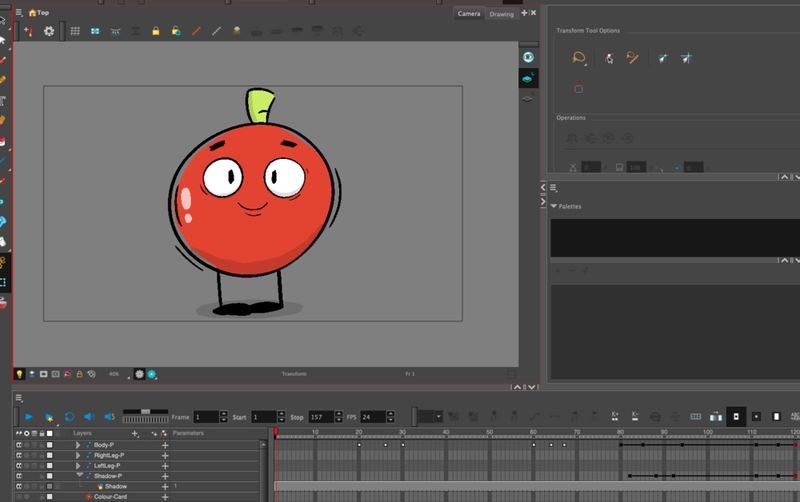 Then when we find a character we are happy with and ready to animate, we export the drawing to ToonBoom Harmony where we build an animatable character. Depending on the style of the animation, the construction of the character can vary widely. Tom, however, is very simple so we went for a basic character rig (shapes with pivot points). With Tom’s basic animation finished, we exported the animation to a PNG sequence for later use. Next we went back to Autodesk Sketchbook to create a background for Tom to sit on. We cheated a little bit and built an environment within Blender which we then used Sketchbook to paint on top of. Isn’t it magical how you can use so many different bits of software for just one project? Once we were satisfied with the backgrounds, we imported everything into Adobe After Effects for compositing. We also added sound at this point (which is basically stealing sound effects from YouTube and talking into an iPhone). True, you can add sound in Harmony but we’ve been using After Effects for so long that the workflow is just ingrained at this point. Next up, we might try a few more animation tests with our other characters (Enis the Tennis Ball or White Guy the Tennis Player) but what we’re mainly focused on now is creating the finished animation. Keep an eye out for that next bit of behind-the-scenes fun!